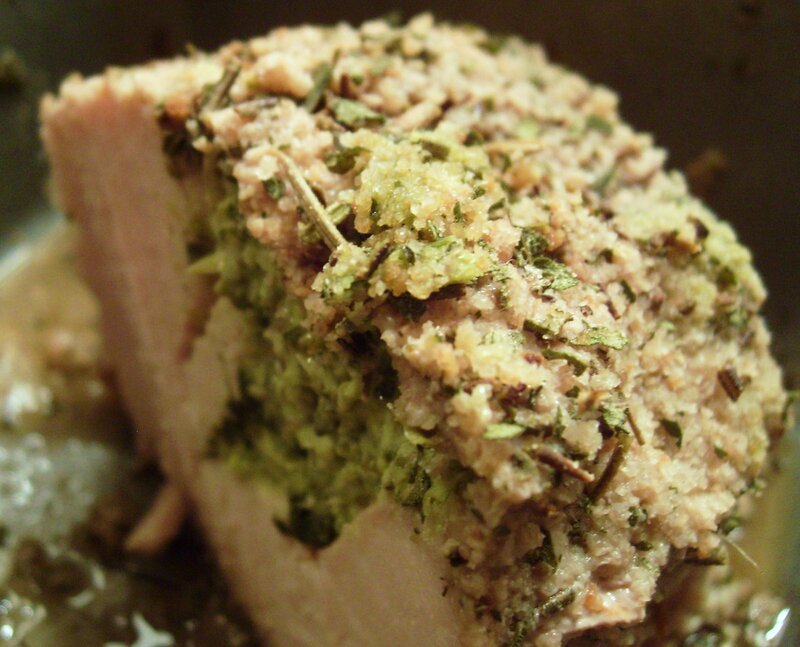 Stuffed Pork Roast – Nutrition.Health.Life. 1. Preheat oven to 400F and grease a loaf pan. 2. Lay the tenderloin on a cutting board. Starting at the upper right hand corner of the tenderloin, cut crosswise (from front to back) of the tenderloin until the knife is 1 inch from the left side of the tenderloin. Now, cut at a 45 degree angle down (this will be where the filling goes). Repeat this as you work your way down the tenderloin. When you are finished the tenderloin should easily open up but still be able to close back up. When finished, place tenderloin in the pan (you can wait to do this until the tenderloin is stuffed if you’d like). 3. In a food processor blend the mayo, cream cheese, and spinach until well mixed. Add the fresh basil, garlic, and some Parmesan cheese to taste. 4. With a spoon or rubber spatula begin stuffing the tenderloin, starting at the top and working your way down. The pork won’t close fully when you are done, but most of the filling should be inside the pork. 5. In a small bowl mix the breadcrumbs with your desired about of herbs and seasonings. With your hands, pat this onto the top of the tenderloin. 6. Cook at 400F for 45-60 minutes, or until the tenderloin reads 160F.